The White Eagle Saloon is proud to host WRITERS WHO PLAY, an evening of accomplished writers who are also accomplished musicians. Ken Waldman, Alaska's Fiddling Poet, will be joined by Jim Clark from North Carolina, Marck Beggs from Arkansas, Will Jennings from Iowa, Willi Carlisle from Arkansas, Jeanie Murphy from Washington, and Evan Morgan Williams and Kate Power, both from Portland. They're all just some of the writers who will be appearing on stage throughout the night with their instruments, a group of poets, short story writers, essayists, and novelists who all play music. 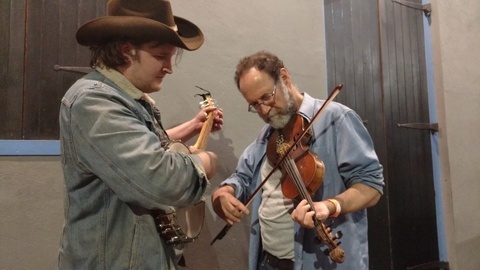 Some of their stage credits include A Prairie Home Companion, Kennedy Center Millennium Stage, Telluride Bluegrass, Festival of American Fiddle Tunes, and Ozark Folk Center.